Last month we wrote about the upcoming "double-capacity" DDR4 kits and now there's an official announcement from G.Skill. The latter cooperated with ASUS to create a custom, taller memory module that features 32 DDR4 memory chips with 1GB capacity each, whereas traditional modules allow a maximum of just 16 DRAM ICs. This results in modules with a capacity of 32GB, allowing the installation of 64GB DDR4 in a motherboard with just two memory slots. Do note that these DC DDR4 modules are exclusively supported by select ASUS Z390 motherboards, so compatibility-wise this is not ideal. G.Skill offers a 3000MHz kit with 14-14-14-34 timings, as well as 3200MHz kits with 14-14-14-34 and 14-15-15-35 timings. All modules are offered in 2x 32GB kits. G.SKILL International Enterprise Co., Ltd., the world’s leading manufacturer of extreme performance memory and gaming peripherals, is excited to announce Trident Z RGB DC series DDR4 64GB (32GBx2) memory kits. 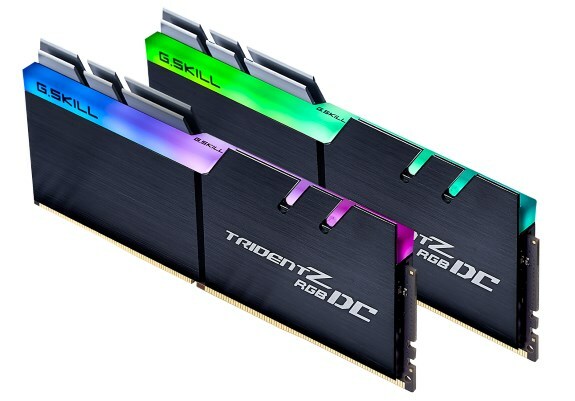 Utilizing the latest Double Capacity DIMM technology closely developed with ASUS, the Trident Z RGB DC series DDR4 memory is able to provide double the maximum capacity of DDR4 UDIMM modules on select ASUS Z390 chipset motherboards. Engineered by the experienced G.SKILL R&D team, the Trident Z RGB DC series at launch is meticulously designed with powerful Samsung B-die ICs to deliver ultra-fast overclocking speeds up to DDR4-3200MHz at CL14 timings, even with 64GB large capacity kits.